TheScubaGeek.com » Release The Kraken! When I left Roatan in October 2009, one of my biggest worries was that I would never get to taste a rum as fine as Flor de Caña again. This sweet Nicaraguan nectar that had graced many a rum and pineapples during my five year Caribbean tenture was a thing to be treasured. The liter that I brought back to the States with me lasted a mere week, and, with the exception of one truly exceptional night in which Lia Barrett and I shared a spectaclar bottle of Flor de Caña Centenario 21, I was never to taste her again. I tried to compensate for my loss with various other substitutions. Sailor Jerry’s remained my favorite of the commercially available spiced rums, and Captain Morgan’s Private Stock would substitute in a pinch. I even suffered through Bacardi, but only out of desperation. Still, nothing could compare to the sweet, smooth sensation of sipping a glass of Flor. When I walked into Aaron’s Dive Shop in Kailua, Oahu, they asked if I knew about the Kraken. Of course I did: mythological super-massive squid capable of destroying entire boats and villanous CGI monster in the second and third Pirate of the Caribbean films. Not that Kraken, they retorted, THE Kraken. I was confused. Do you like rum, they asked. Hell yes! A few minutes later, an ornately decorated bottle filled with a pitch black liquid emerged and glasses were poured. The scent was the first thing that struck me: sweetly mellow with a hint of vanilla. Then there was the taste— oh, the taste! Light and sweet up front, the darkness settles in to the back of the throat with a slight burn followed by a truly unique spiced aftertaste that bears a hint of cloves. It was easily drinkable without a mixer; in fact, every mixed concoction I have since tried has diminished The Kraken’s glory. I prefer it on the rock with a small splash of water— truly a sipping rum. 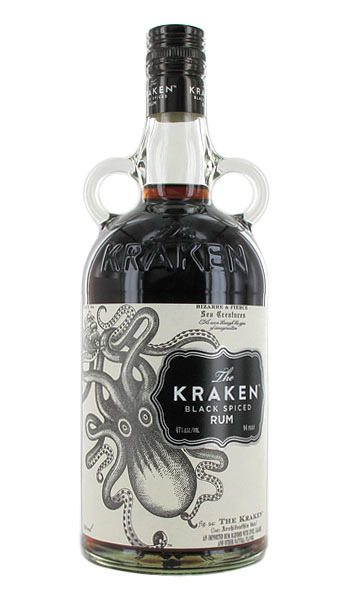 At 94 proof, The Kraken Black Spiced Rum will hit you harder than anticipated. I’ve already had two mild hangovers as a result of crackin’ The Kraken, but due to the high quality of ingredients they aftermath was certainly bearable. As far as I can tell, The Kraken is in limited release at the moment (it only arrived on Hawaii in January) but is set for a big international debut later this year. At $21 for a fifth, it’s within the competitive price range of other commercially -available quality spiced rums, but this one easily outstrips the other for pure flavor and drinkability. Keep an eye out for this awesome rum at a liquor store nearby. Release The Kraken! What an interesting name for a seemingly interesting drink! Though i think it’s black color makes it kind of aversive, i will still give this one the benefit of the doubt and try it when it’s finally available. Release the Kraken now!